Posed against a stark, plain backdrop the white body and dark head of this Springer Spaniel really stands out, highlighting the dog's character. Many types of spaniel were developed in the 19th century, and the English Springer breed was officially recognized by the Kennel Club in 1902 (and the American Kennel Club in 1910). 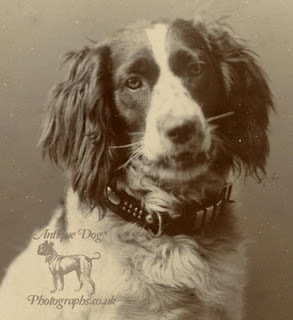 Drury writes about this in his 1903 book on British dogs, saying "The good old English name has been given recently revived by the Kennel Club to designate the old-fashion, medium leg Spaniels of all colours that are neither Clumber nor Sussex Spaniels." 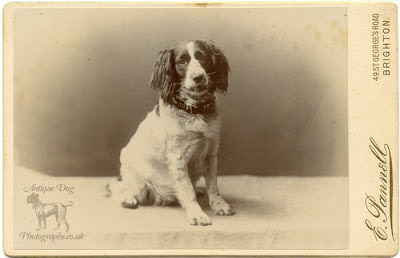 The true English Springer differs little in figure from the Setter, except in size, being nearly two-fifths less in height and strength than the Setter; delicately formed, ears long, soft and pliable, coat waving and silky, tail somewhat bushy and pendulous, and always in motion when actively employed. The photograph was taken by Ebenezer Pannell. In 1881 there were over 30 photographic studios in Brighton and census information tells us that Ebenezer was working in one of them, by 1883 he was running his own studio. He had a number of different studios throughout the mid-1880s eventually opening up for business at 49 St. George's Road where the Spaniel photograph was taken. Below is a group portrait of the Pannell Family taken c1890. 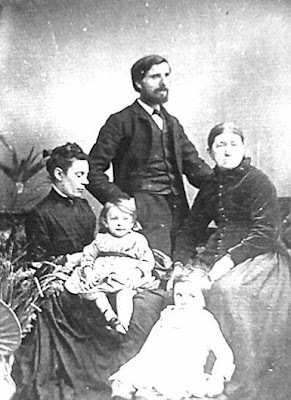 Ebenezer Pannell, his wife Mary Ann Baker (born c1853), their two children - Ella Mary Pannell (born 1888), and Ebenezer William Pannell (born 1886). Ebenezer's Mother-in-Law, Mrs Mary Baker (born c1820, Hereford) is seated on the right. The Pannell family was a true family of photographers, as three of Ebenzer's four children would go on own and run their own studio's or work as photographic assistants for their father.